I know I get very excited about these recipes, that I spend a good chunk of every post gushing that the subject is the best cake! The loveliest bread! The spiciest soup! And I always mean it, but this time, guys, this time I like really really mean it. This is amazing. This is incredible. This recipe is my new favorite thing. I want to eat it every single day. Midway through winter it can be easy to grow tired of root vegetables. They're one of the only things still in season at the grocery store, they're on every seasonal restaurant menu in town, it can begin to feel like you've had them just about every way you can. 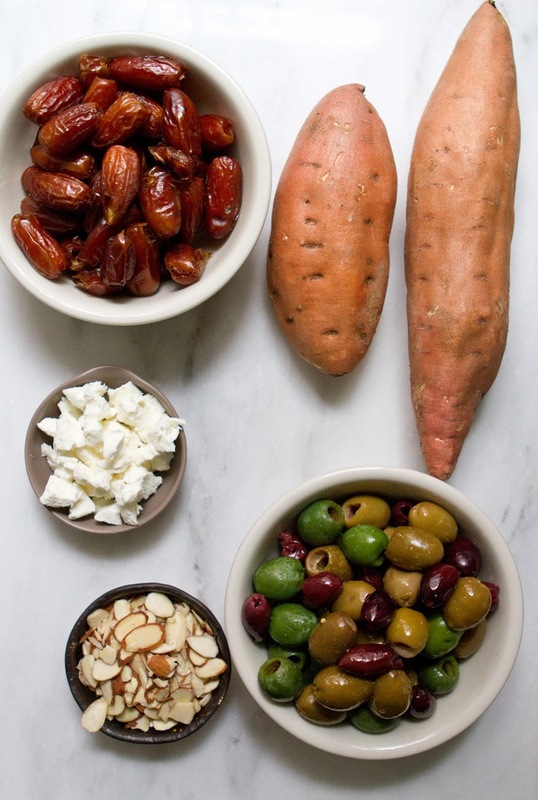 This recipe totally shakes up sweet potatoes for me and makes them into something new and different and exciting. The dressing is super easy and quick to make, and I feel you could make substitutions to it freely. 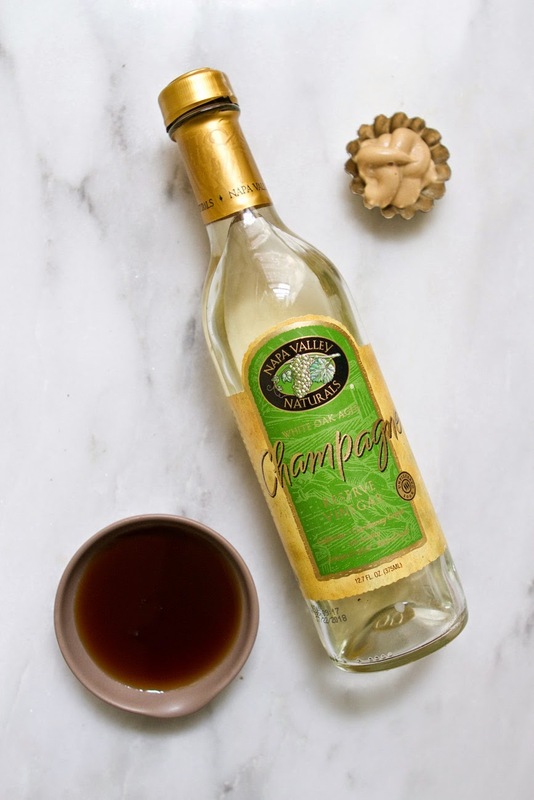 If you don't have any champagne vinegar, for instance, feel free to use apple cider vinegar, or even lemon. I originally wanted to use date syrup in place of maple, but I couldn't find any date syrup in my neighborhood, so I went with maple which was delightful. Who doesn't love maple and yams? 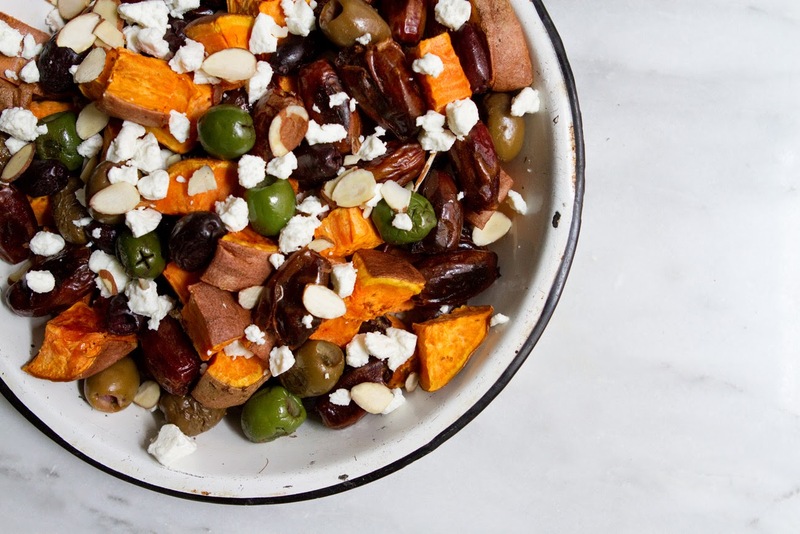 Roasting dates and olives may sound a bit strange if you've never tried it before, but both are truly delightful roasted. 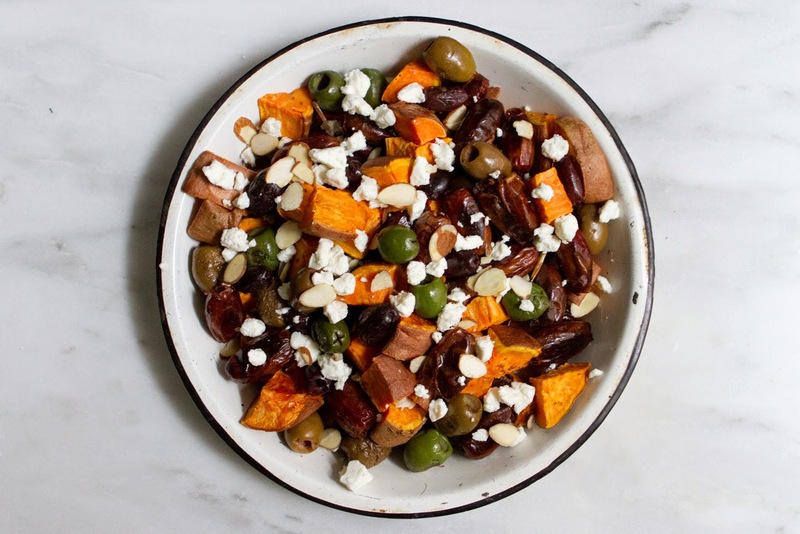 The roasted olives are warm and sort of meaty in texture, with bubbly skins while the dates become deeper and darker in flavor, more condensed tasting, caramelized, their skins become firm and crispy and the flesh gets chewy and wonderful. I made this dish on Sunday morning, and after photographing it I headed out for a run. It was chilly and clear and a bit breezy, and there were many more runners out than your average morning, probably hoping to make up for all the calories they were going to ingest at Superbowl Parties later. I was listening to an episode of Serial on my phone as I jogged and I ended up getting so caught up in it (and the Moth project episode that followed it) that I ran my longest run ever. As soon as I got home, my cheeks windburned, my skin frozen, my leg muscles on fire, I collapsed on our couch and devoured a huge bowl of this stuff. 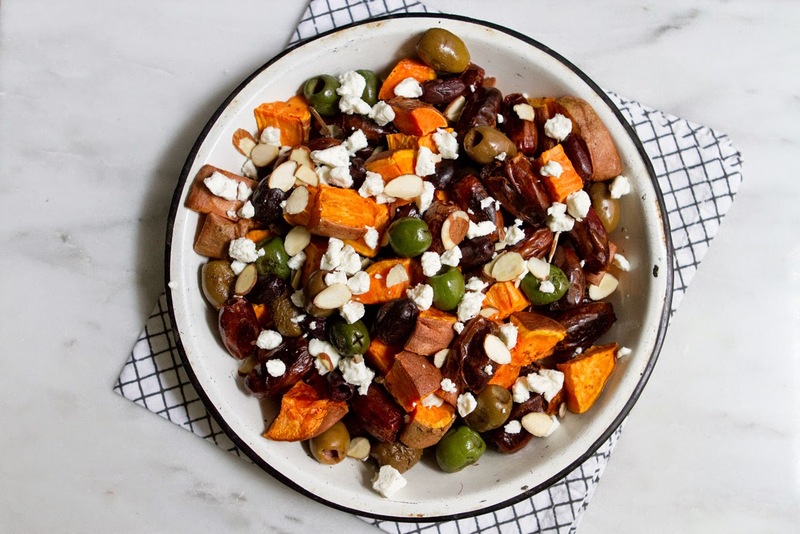 The chewy dates, meaty olives, creamy-earthy sweet potato, tangy goat cheese, and crisp almonds were so lovely, and the flavors so perfectly blended, it was the perfect post-workout meal. 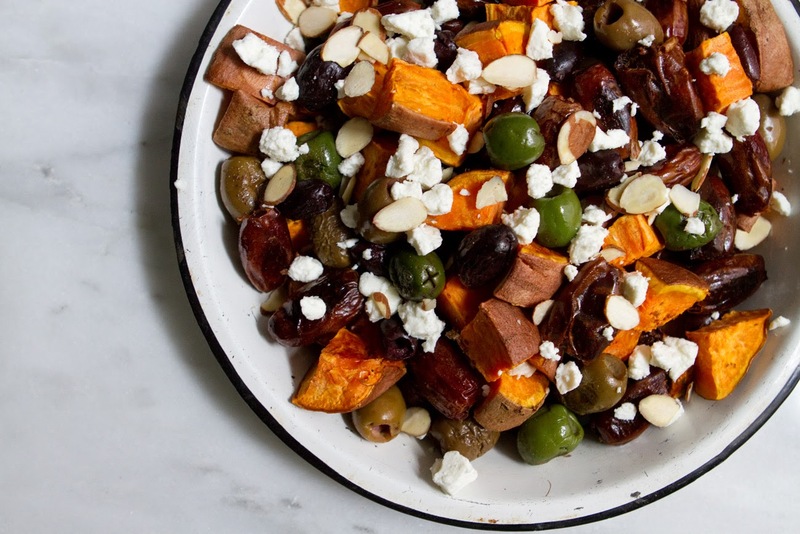 I know I'll be adding this roasted salad to my dinner party lineups asap. It would be wonderful served alongside a lamb chop, or with roast chicken. It's also wonderful on it's own as lunch, or served over a bed of wilted greens for a vegetarian dinner. Enjoy! Cut potatoes into 1" cubes, toss with 1 tbsp olive oil and a dash of salt and pepper and spread out covering half of a large sheet pan. Roast for 20 minutes. 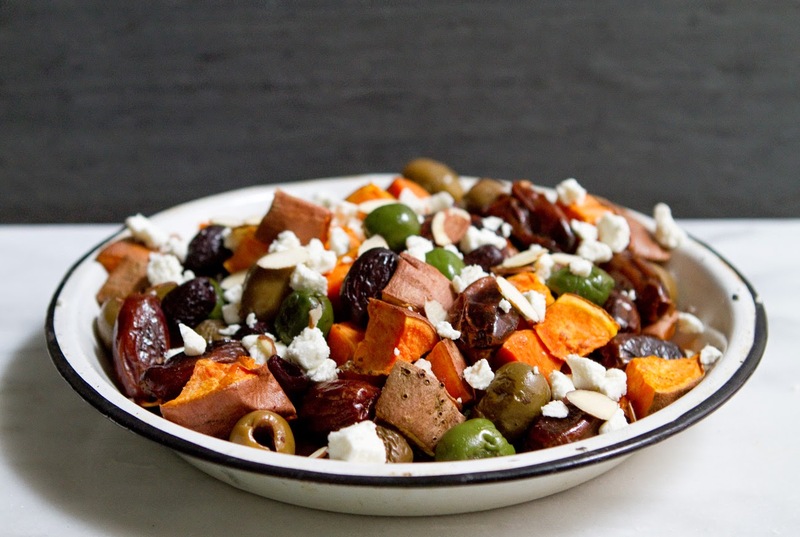 While potatoes are roasting pit any unpitted olives and dates and toss together with 1/2 tbsp of olive oil. 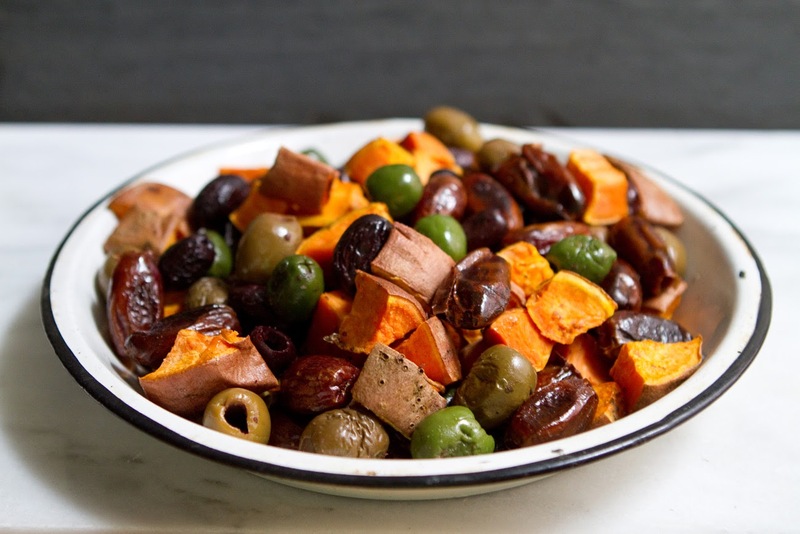 After potato has roasted 20 minutes, remove the sheet pan from the oven, speed the dates and olives out on the remaining empty half, and roast for 10-12 minutes, until they're sizzling and bubbling and lovely. Remove from oven. While roasting, prepare the dressing. Whisk together the maple, champagne vinegar and mustard. Set aside. 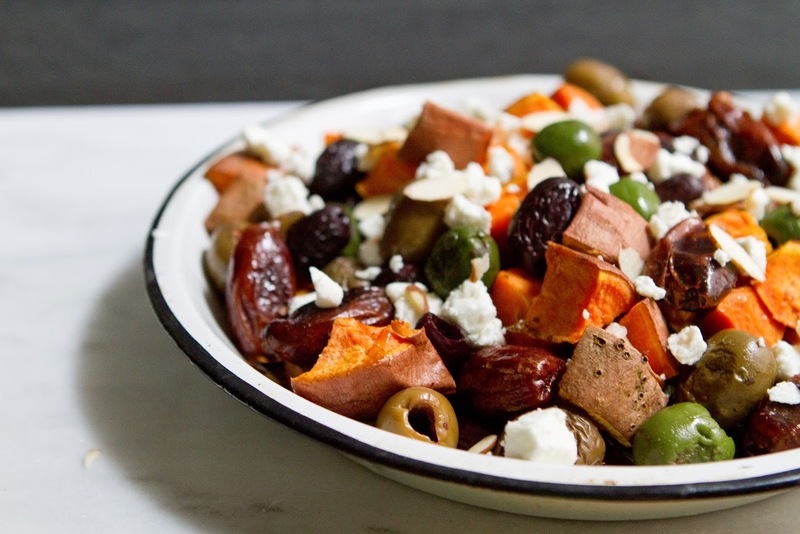 Combine roasted potatoes, olives, and dates in a large bowl. drizzle with the dressing and toss to combine. Sprinkle crumbled goat cheese and sliced almonds on top and serve. Enjoy!